A not so plenary session in the European Parliament (week 11, 2013). Discussion on “Integration of migrants, its effects on the labour market and the external dimension of social security coordination”. 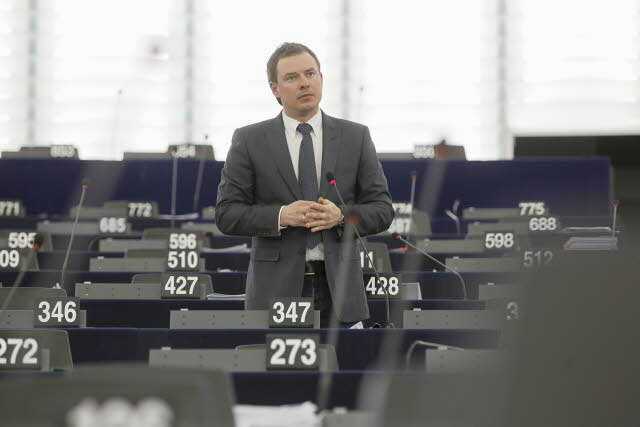 MEP Piotr Borys (EPP-Poland) has the floor in a deserted room. Labour mobility within the European Union is considered as the main decompression mechanism of social and economic pressures, created by differences in growth rates between member states. Looking for a job or working in another EU country has been praised by politicians and Brussels bureaucrats as the best way to increase the overall competitiveness of the EU. Yet to this day it’s impossible for workers to secure their supplementary pension rights. On many occasions even the statutory pension rights are highly compromised for people who have worked in two or more EU countries. For example the chaotic social security legislation in Greece and some other member states create insurmountable impediments for persons in the middle of their working life, if they decide to take up a job in another member state. In view of this reality the European Commission in 2005 proposed legislation to mitigate those problems. The first reading took place in the EU Parliament in 2007. The legislation was then blocked in the Council for six years, due to differences among member states’ pension schemes and the unanimous vote requirement. The entry into force of the Lisbon Treaty meant the text could be put to a qualified majority vote, enabling negotiations to resume. After six years of deadlock the European Parliament and member state Council negotiators reached agreement last Tuesday afternoon on rules to allow EU workers who move to a different EU country, to safeguard their supplementary pension rights. However the Lisbon Treaty may have sidestepped the barrier of unanimity, but still the chaotic differences of social security legislation in member states are still there. Probably that’s why the deal struck between Parliament and Council allows for a 4-year deadline to transpose the directive into national law. Hopefully after four years the current huge differences in unemployment rates between member states may decrease and thus reduce the strong incentive for southerners to look for a job in northern EU countries. In any case the new legislation will not be in force during the current period when it is badly needed. Given that, the statement of the Parliamentary rapporteur Ria Oomen-Ruijten (EPP, NL) is rather undue. She said that “European workers can now enjoy full pension rights, when they move to another Member State. The legislation will help to eliminate barriers to the free movement of workers”. Both assertions are wrong, it’s not now nor full rights are protected. As a Press release issued by the European Parliament explains the main provision of the new legislation is that “the “vesting period”, i.e. the period of active membership of a scheme needed for a person to keep supplementary pension entitlements, must not exceed three years”. In any case most of those supplementary pension schemes have already introduced such provisions. This is particularly true for schemes which have a private pension fund character. They usually pay to their members a pension supplement, after say the age of 65, under the logic of capitalising their contributions. It’s like contracts with private insurance companies. In short, this new legislation would change nothing during the next four years and when applied, in most cases it will offer something which is already provided.